Small paper punches are used for more than just paper shapes. You can punch them on different materials to make useful stencils for a range of craft projects. While they mainly create stencils with larger outlines, lacking the fine detail of miniature stencils made for dollhouse wallpaper like the black country miniatures stencils they are useful for many larger design projects where fine detail isn't essential. To Make Flexible Self Adhesive Stencils punch your design into a thin sheet of lightweight clear vinyl, or self-adhesive stencil material sold by companies like Plaid online and Martha Stewart Crafts. This method works best for larger outline punches with few small details. The punch must be able to cut through the vinyl, so make sure you use the thinnest vinyl you can find. You can find vinyl at fabric stores which sell it for clear upholstery covers or table covers. It is also the material used for self-adhesive protective covers to protect telephone and camera viewing screens. You may find it used as a protective cover or for self-adhesive stickers on many new electronics. Stencils made from self-adhesive vinyl can be washed and should be stored on a baking sheet to keep them clean. You can make quality stencils for dollhouse wallpaper or furniture by punching your designs through coated freezer paper or parchment paper. The paper will withstand several uses with care, enough to stencil a small room at least, and the smooth coated surface can be wiped off if necessary as paint builds up. Clear stencils are important if you need to reposition and line the stencil up with previously stenciled designs. Most paper punches will cut through thin clear acetate sheet, or plastic page protectors, giving you sturdy stencils you can see through. Where you need to shape a stencil to a surface, you may prefer to use a vinyl sheet as mentioned above. Vinyl will self-adhere to many curved surfaces. Floor Tiles - Use Custom stencils on a colored card to make floor tiles for dollhouse scale projects. Doilies - Punch out a basic shape from foil or white paper and add a stenciled design to make custom doilies to present your miniature food collection. Use Them for Stencilled Wall and Fabric Designs - border punches, and small linked punches work well for repeat designs. Run them in reverse order for a wallpaper stencil, or use them to border a rug or fabric. Where to Find Suitable Punches - Scrapbook and craft stores sell a wide variety of small punches. 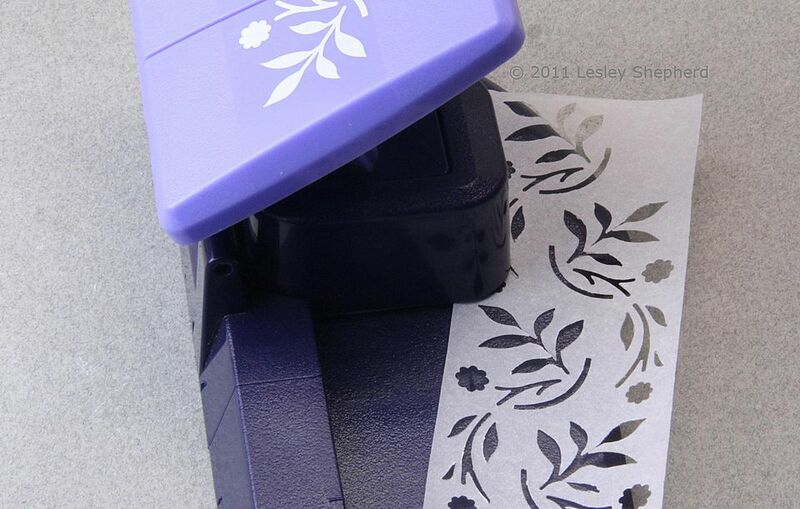 You can use both the border and stand-alone design punches to make stencils. Just check that the scale is correct for your project. When you have punched your stencil design through your chosen material, cut a square border around the design, and mark the corners with a "registration mark" a small cut or circle that lets you see a pencil mark made through the previous placement of a stencil. Registration marks aren't necessary for clear or semi-opaque stencils (vinyl, acetate, or parchment paper) where you can see the previous design to locate where the next repeat must be placed. Use a stencil brush or a micro brush, to dab paint or fabric paint through your stencil. Foam 'dabbers' sold at scrapbook stores and small foam makeup brushes will also work with small thin stencils. Don't load too much paint on the brush, you want to avoid leaving thick lines of paint around the edges of your stencil where they may creep through. If possible, use the brush in a gentle 'pouncing' motion, straight up and down through the stencil, to keep paint from seeping under the stencil edges. If you have too much paint on your brush, gently pounce it up and down on a paper towel to remove some of the paint before you try to use the brush on your stencil.